Yu Kuang is a pop music promoter and concert agent, who invited Michael Jackson to Taiwan for the Dangerous tour in 1993. He appeared visibly upset during a TV news appearance when the news of Michael Jackson's death broke last June. He expressed that he was in shock and very upset at the news of Michael's passing. and paid his tribute to Michael Jackson as one of most iconic and influential artist in the music world. A rare talent that may not happen again for generations. During Yu's career, he was the first person to bring Western pop music to Taiwan since the 1960's. He began with radio and television and also had a music magazine. From 1982 onwards the government began to liberalise the political system, rules were gradually more relaxed in various social and culture aspects. Yu started to bring in European and American big name pop and rock bands. However, he's best remembered for bringing Michael Jackson to Taipei for the Dangerous tour in 1993, in which time, the culture climate was ready to embrace him. Yu put in great effort to secure the opportunity of Michael Jackson coming to Taiwan for the first time. He did everything he could to meet all the requirements including sorting out a large capacity stadium, and sponsors, which convinced the agent and finally enabled the concerts to take place and be a huge success. However, the Dangerous tour in Asia was eventful. 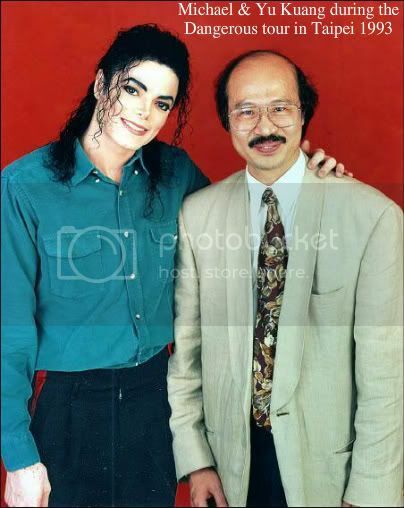 Just after Michael kicked off the Asian leg of the tour in Bangkok on the 24th August, the first child abuse accusation against him was made public. Two performances in Thailand and Singapore had to be cancelled because Michael suffered from acute dehydration and exhaustion due to the emotional stress cause by the accusation. Though the tour was heavily insured. Yu was relieved when Michael finally landed at the airport in Taipei on 3rd September, with his friend Elizabeth Taylor who had flown out to support him. The original dates for the Dangerous tour concerts in Taipei were rescheduled for the 4th and 5th September. Being the most iconic pop star to ever visit the country at the time, the media frenzy and coverage was unprecedented. Screaming fans surrounded Michael's hotel, calling his name and pursuing him everywhere he went, hoping to get a glimpse of him. Michael's amazing super stardom and presence had made a real impression, he was back at his best in Taipei. His outstanding live performances set a new standard in the country and he certainly lived up the name 'King of Pop'. Even after the event, Michael was talked about in the media for 3 months! 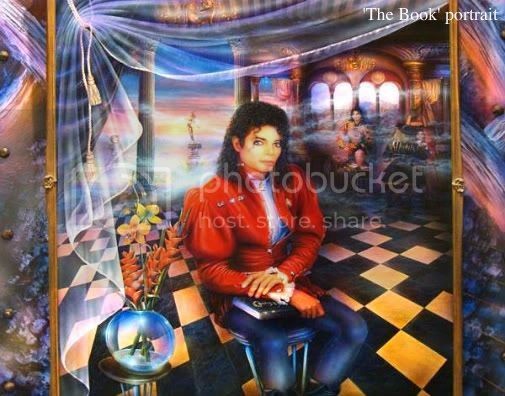 After the Dangerous tour in Taipei, Michael showed his appreciation by sending Yu a copy of his favourite portrait of himself 'The Book' as a gift to thank Yu for all his effort and help. 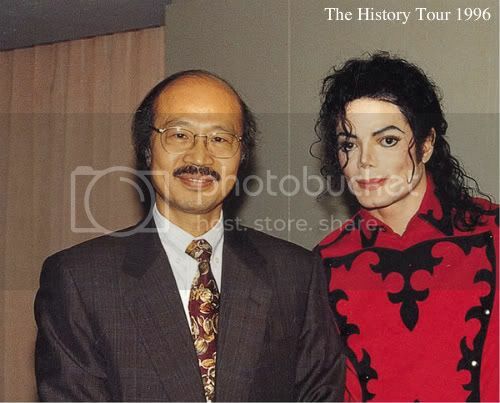 Michael came back for the History tour 3 years later in October 1996, which was then organized by anther agent in Taiwan. 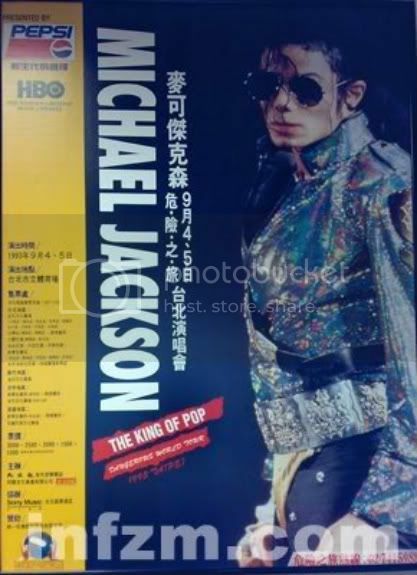 There were two performances in Taipei, and one in Kaohsiung, which was to become Michael's final world tour. Yu met Michael on 3 different occasions. He recalled when meeting Michael for the first time, noticing his nose was just like the Disney cartoon character Peter Pan's, with the tip of nose slightly tilted, Michael did refer to himself as Peter Pan in the past. "He was very friendly with a very soft voice, like a whisper, and very shy, like a little boy." The Michael Jackson he knew was simple, pure and had a childlike innocence, but on stage Michael was a super star. 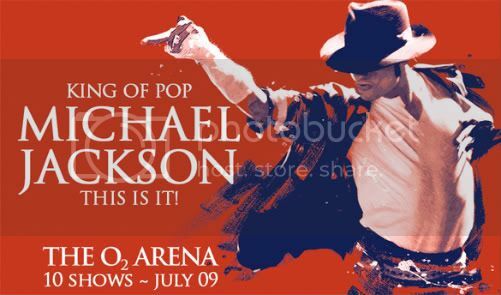 He remembered that Michael especially requested the 'King of Pop' title had to be included on the promotional posters, clearly showing that Michael was very confident that he was definitely the 'King of Pop'! Yu remember bringing some children to meet Michael after he expressed his wish to meet some local children. With the children Michael has a "natural, heartfelt joy that came from within" said Yu. Yu even met with Michael's family, when his parents and brothers flew out to Taiwan to offer support due to the accusation. Yu recalled how he waited in a room with Michael's Dad and brothers for 'an appointment', which was the extent of protection from his bodyguards. To Yu, loneliness seemed to play a prominent part in Michael's life. After Michael's sudden death, Yu's biggest regret was that he was not able to help Michael tour China, Yu felt he had let Michael down. Michael had briefly visited mainland China and Hong Kong as a tourist during the Bad Tour back in the late 80's, he was fascinated by the culture and people. According to Yu, Michael had very strong desire to perform in China, during his 93' Dangerous tour in Taiwan, Michael had personally asked for Yu's assistance to help him achieve this ambition. When Michael returned to Taiwan 3 years later for the History tour, he arranged to meet with Yu, again raising the proposal of going into China, and even signed contract with Yu as indefinite priority agent to co-ordinate his future performance in China. In fact, according to insiders there was a Chinese Mainland company in close contact with the Dangerous tour organizer. Beijing was going to be one of the stops along side Taipei, (even Hong Kong was on the list but was later cancelled, the reasons may have been because of not having a big enough stadium, or the noise concern by local residents) in the end, the Beijing tour did not happen. 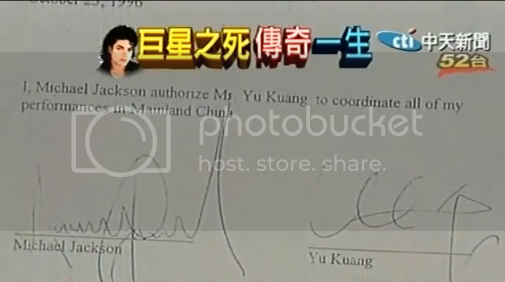 It was in a different time and there was lots of speculation as to why, but one reason known to Yu was that after the relevant authority had seen Michael's music video and material that had forwarded to them, the response was that they didn't think that one of Michael's dance routines (grabbing his crouch) was in line with Chinese Custom! Yu exclusively told the Chinese Nanfang Daily reporter during an interview. Since the announcement of Michael's O2 'This is it' concert, Yu had been in talks with a Chinese concert agent that intended to bring the show to the mainland. Yu suggested to wait until the end of the London concerts before pursuing it further. Yu never thought Michael would pass away so suddenly, the Chinese tour would sadly never become a reality for Michael. Taiwan turned out to be the only Chinese country and region that Michael had performed in. Millions of mainland Chinese fans regretfully will never see the King of Pop live in concert on Chinese soil. Rest in peace, forever the King of Pop! The usual, self-proclaimed rumours, which started back in early 90's and grew legs. They even spread it around that MJ demanded Oprah refer to him as KOP, or no interview at Neverland -(1993). She brought this up during the interview and made it clear that not only was it another rumour doing the rounds, but that it was also NOT TRUE!! MJ stated he never proclaimed himself to be anything...and with the usual, negative and ALWAYS unproven rumours regarding MJ, I will believe what HE states, and the last paragraph of my post only helps reaffirm it for me, regarding this BS. The KOP title section of this interview sounds no different than the same "demanding to be called KOP", anti-MJ rumours, first put out in the Dangerous era. Even here, not only are we not able to see the man in above photo literally speaking, himself (Things DO deliberately get twisted and spun when not on video, for example) but as mentioned, it is the same way they continued and spread this this rumour for Oprah - only difference is, she was able to confront that rumour on video and debunk it. Reality: MJ was being referenced with the KOP title from way back in the Thriller era - Chicago Times and New York Post (84). Elizabeth Taylor; she merely extended on it. There are various media articles not only referring to him with noble titles: “New Reigning King of Pop" - "King of Rock", etc. There are fans that have done their homework, shared and saved this information - information that lying anti-MJ detractors obviously didn’t bank on being available. Links available (Not sure links can be posted here), should anyone request them!